Solvers do the work of calculating how simulated objects (RBD objects, wires, cloth surfaces, fluids, etc.) behave. They look at the data attached to objects (and may attach some of their own) and use it to run the simulation. For example, the RBD solver will look at the physical data, such as density, and forces, such as gravity, attached to an object to determine where to move it (updating its position data). If an object doesn’t have a solver attached to it, it won’t do anything when the simulation runs. The solver that should control an object is attached as another piece of data on the object. Different types of simulated objects can affect each other (for example, RBD objects displacing smoke). Objects cannot be controlled by multiple solvers, but you can attach a solver that itself uses multiple solvers, such as a Blend solver. See below for more information on combining solvers. When you use the shelf tools to create simulation objects, they will attach solvers for you. If you're working in the network, you will need to create your own solver nodes and attach them to your objects. Process the network to establish objects and data attachments. Run solvers on the processed data tree. Gray inputs are "objects plus data". The connections pass through or modify objects by adding data to them. Green inputs are "data". These represent pieces of data that will eventually be attached to an object or objects using an Apply Data node. Nodes that attach data usually accept either a gray input (an object or objects to attach the data to), or green inputs (an accumulation of data packets to add to). The type of input connection you make to the node (gray or green) changes the output to the same type. For example, a simple network consists of an object creation node, forces, and a solver. 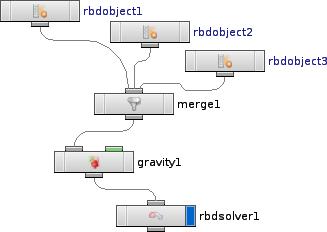 In this "data-centric" layout, pure Force and Solver data outputs from the Gravity and RBD Solver nodes are attached to the RBD Object using an Apply Data node. Note that data nodes attach their piece of data applies to all nodes above them in the network. 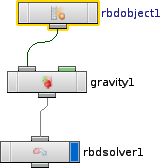 In the network above, the Gravity and RBD Solver nodes will attach Force and Solver data to all three RBD Objects, because the objects are above the gravity and solver nodes in the network. Use Merge nodes and connection branching to control which data gets attached to which objects. It’s especially important to make sure that each object only gets one solver attached. For more information see DOPs input and output. See caching simulated geometry to disk. The default is "Set initial", which sets/imports the data at the first frame of the simulation. If you are importing values or geometry from outside DOPs where what is being imported changes (or may change) depending on the frame (for example deforming geometry or values referenced from other networks that use a time-dependent expression), you should change the menu for any parameters that need the updated value to "Set always". Using "Set always" is quite a bit slower, since it must constantly rewrite the data tree, so you shouldn’t turn it on unless you really need it, and turn it on for as few parameters as possible. Houdini sorts out the objects in the scene based on relationships to determine the order in which to solve them. For one-way relationships, affectors are solved before the affected objects. Wherever a mutual relationship exists, or wherever a hierarchical group of relationships creates a loop, all relationships in that group must be solved simultaneously. Apply forces to objects in the order — left to right, top to bottom (in the network). If anything collided, feed the collision forces back into the objects. For static objects this feedback step is optimized out. Repeat until no collisions or Max feedback loops is reached. The Max feedback loops parameter on the DOP Network containing the simulation limits the number of collision feedback loops Houdini will run, to speed up the simulation and prevent infinite loops. The best order for solving RBD simulations is to evaluate the heavy objects first, before the light objects. When wiring nodes manually, you can try to wire heavy objects to the left of light objects in Merge nodes. When creating networks automatically, Houdini will assume that particles (solved by the particle solver) are light, and try to wire them to the right of other objects. If you're simulating heavy particles, you may want to change the wiring order. Houdini includes several utility solvers for setting up more advanced networks. Multiple solver runs multiple solvers in order on the same objects. Blend solver runs multiple solvers and blends between their effects, based on blend factor data on each object. Use the Blend Factor node to attach blend factor data to each object. Switch solver routes objects to different solvers based on a piece of switch data on each object. Use the Switch Value node to attach switch data to each object. The switch solver is similar to the Switch node, but where the Switch node operates during the data attachment step (and so can affect which data gets attached to which objects), the Switch Solver runs in the solve step (and so can see all data attached to all objects). Script solver runs a script that can potentially change data, update positions, etc. Several HScript commands, expression functions, and HOM classes exist to enable writing scripts to modify dynamics simulations.